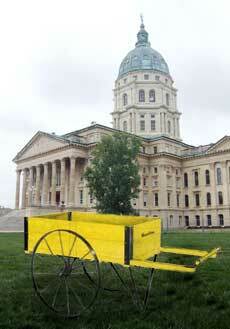 We're proud to say that a Hamilton cart helped end prohibition in Kansas back in 1948. Earlier this month the Kansas Historical Society contacted us to sniff out the details of the cart used to deliver mail to the statehouse in Topeka, Kansas. Although the cart is no longer in operation, it's still around, and they tracked us down by its label. It reads: "Hamilton / Truck / Manufactured by / THE HAMILTON CASTER & MFG. CO. / HAMILTON OHIO, U.S.A."
After contacting a retiree, we identified the cart as a 496-R Hand Cart, which offered oak hardwood construction, steel-spoke wheels, rubber tires and a maximum capacity of 500 pounds. We began manufacturing these carts as early as 1940. The graphic is from our truck catalog in 1959. As for the bill that repealed prohibition in Kansas, it was one of hundreds of proposed bills that traveled from the printer to the statehouse in our old-school cart. We're not sure how many years the cart stayed in operation, but we think the people of Kansas are quite happy it served its purpose well. 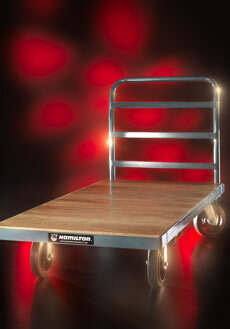 Visit any warehouse around the world and you'll likely find one of our most popular carts, the PB1108 2000-lbs. class platform truck. It's been an industry staple for years because of its durability and reliability. But we knew we could make it even better, so we put two teams on the job to give this workhorse a boost. Here are the results. We've lowered the cart's list price, and we can ship it from our factory within 24 hours by eliminating wasted time, movements and resources. Smoother running gear improved its rollability with less rolling resistance. Compared to rubber-tire competitors, we cut starting force by 20 percent by using 8" by 2" premium mold-on, rubber-tired wheels with ball bearings. We put ergonomics at the forefront of this design. Premium wheels reduce operator fatigue and the risk of related injuries. Need more details on our workhorse truck series? See our website. Never appear desperate, just like dating, when you're at an event and your main purpose is hunting down new customers and clients. Talk your prospects and listen to what they have to say. By building a relationship first, you'll have an easier time networking. Cut the jargon in conversations. It's important that anyone (and not just those in manufacturing) can understand what you're talking about. Connect with everyone. 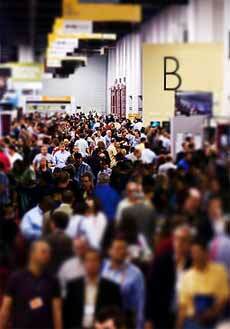 People from a wide variety of industries attend manufacturing tradeshows. Don't write off the IT guy or the social-media guru, because you never know what leads await you. For more tips on networking at tradeshows, see the article on Mashable. The Big Number: 12 Wheels. Any Setting. Duralast®: Our most popular and time-proven 90A poly-on, cast-iron wheel. 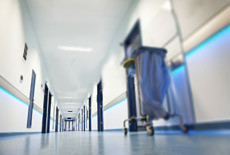 Duralast® XC: Harder polyurethane (70D) provides 30 percent extra capacity than standard Duralast®. Ultralast®: Hamilton's ultimate urethane tread-on, cast iron. Well-suited for continuous operations. Super Ultralast®: One-inch thick ultimate urethane bonded to drop forged steel center. Poly-Soft®: Soft poly, tread-on cast iron center (82A) requires less starting force and rolls quietly compared to standard poly. Superlast®: One-inch thick poly tread (90A) bonded to drop forged steel center for the ultimate rugged wheel. Superlast® XC: Harder poly tread (70D) on forged steel provides 30 percent extra Capacity than standard Suplerlast®. Swivel-EAZ®: Twin-wheel, liquid cast poly-on aluminum provide lower rolling resistance and higher capacities than standard poly. Polylast: Liquid cast 80A poly donut tread on aluminum core. Extra Heavy Automotive: Polyurethane (1/2" or 1") chemically bonded to a heavy-duty cast iron solid web center. Unilast®: Solid polyurethane wheel provides high mobility and great load bearing qualities. Poly-Tech®: 90D poly tire bonded to polypropylene core results in attractive and easy rolling wheel. Have a question about which wheel to choose? Call one of our experts at 888-435-1484. We thought our hardened raceways were the smoothest until we stumbled across the world's first perfect sphere. Back in 2008, an optical engineer came out of retirement to create this remarkably smooth masterpiece. And he did it by hand. Twice. The Australian Center for Precision Optics began the project by working with a Russian team that created purified silicon in ex-Soviet centrifuges which were once used for uranium in nuclear weapons. The end result? A pure batch of silicon-28. The silicon was then sent to Germany, where it was grown into a giant crystal by aging equipment. 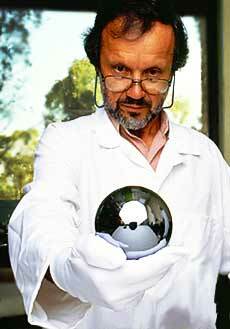 After several attempts, scientists finally succeeded, and two 5-kilogram blocks were cut and shipped to Australia. That's when optical engineer Achim Lestiner was pulled out of retirement to craft two masterpieces. He and his team grinded the spheres by hand with two spinning rotors, similar to how Isaac Newton ground telescope lenses. The sanding process took months to complete, but they succeed in producing two spheres with a smoothness accuracy of .3 nanometers and a curvature of 60 to 70 nanometers. "If you were to blow up our spheres to the size of the Earth, you would see a small ripple in the smoothness of about 12 to 15 mm, and a variation of only 3 to 5 meters in the roundness," Leistner said to New Scientist. For now, these spheres are the roundest, smoothest and most expensive ($1 million) in the world. But in years to come, when the kilogram becomes standardized across different countries, perhaps we'll see more perfect - and even smoother - spheres. A post on the popular Harvest Business Report blog details nine ways successful people operate differently. So if you're like the millions of Americans who have been successful at reaching some goals, but not others, here are some ways to make those goals more attainable. 1. Be specific about your goals. Vague goals leave room for doubt, and they'll likely never get done. "I'm going to talk to five new potential customers this month" is better than "I'm going to find new customers this month." 2. Monitor your progress regularly. 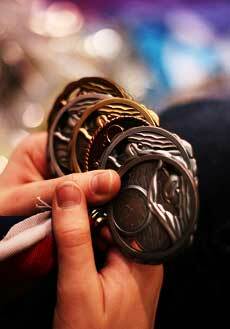 If you know how close or far away from your goal you are, the easier it is to achieve. Depending on the goal, check it daily or weekly. 3. Be realistic. It's important to be optimistic and upbeat about your latest goal. Just don't underestimate how difficult it might be to attain it. You'll need to be prepared and continually stay on top of your goal to reach it. 4. Keep things simple. Don't try to overload yourself with multiple challenging goals. One task is enough. Adding to your plate makes reaching a goal even harder. For more success tips, read the story from Heidi Grant Halvorson on the Harvard Business Review. Â© 2011 Hamilton Caster. All Rights Reserved.